MARVEL TOP TRUMPS! The perfect Christmas gift! 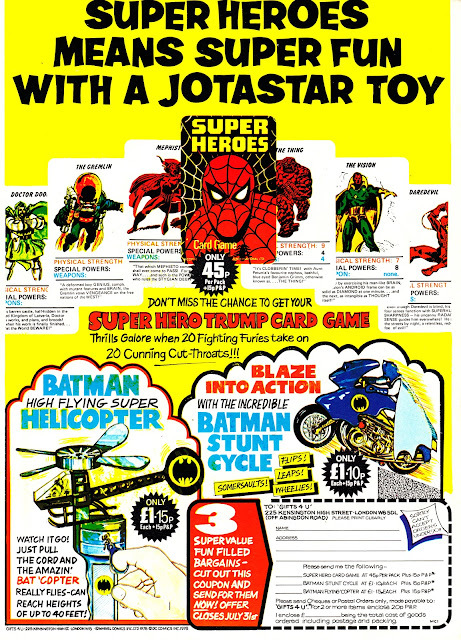 This is an ad, which ran in MARVEL UK's weeklies, from May 1978 with assorted goodies for young super hero fans. I definitely remember someone at school having the mighty Marvel card game. Presumably Galactus gazumped everyone. Hi, wonder if you saw my comment about the MWOM summer special ? And I've replied! That should be no problem! Thanks for tuning-in and have a great festive season! many thanks, i look forward to that !